There is no doubt that the cost of motoring will rise dramatically in the future as countries accept the human cause of an unhealthy planet. This is obvious because even now governments are addicted to taxation. The only real answer to change people's life habits is to make it financially painful to do things that damage the environment. It costs less than $1,000 a year now to register a car. In coming years this will rise to a realistic level of $5,000. It will hurt. Prices in the shops will increase, but the standard of living has to fall to cover the full cost of a green environment. Tax on oil based fuel must go up by at least 500 percent. Coal must be given a very high tax. Power stations using this do pump out tons of carbon dioxide. The price of electricity from dirty power stations must be pushed up. Producing your own solar power is a choice you can make. There will be political consequences due to this dramatic change in people's lives. The poor will attack the wealthy as they see that the rich can more easily cope with the burden. A more equitable distribution of wealth in countries could be the result. Executive bonuses will be the main target. This scenario will happen if the planet is to be saved. Continuing along the current destructive path will result in millions of deaths from natural disasters as the weather moves to and fro. City infrastructures will collapse as the cost of maintaining them rises with repeated damage from bad weather. Man will move back to primitive living conditions will no fresh water on tap and no effective sanitation systems. Can “green tax” incentive reduce pollution country? “Green taxes” (also called "environmental taxes" "pollution taxes" “eco taxes”) excise taxes environmental pollutants goods se produces pollutants. “Green taxes” meant improve environment reduce negative impact environment create environmentally sustainable environment. “Green taxes” kind economic instruments address environmental problems. It generally believe “green taxes” reduce environmental harm least costly manner, encouraging changes behaviour firms, organisations, communities households individuals etc. Taxes pollution provide clear incentives polluters reduce emissions seek cleaner sustainable alternatives. 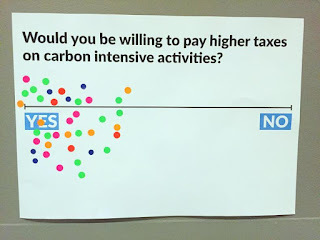 One “green tax” has recently gained favour carbon tax. Australia introduced carbon tax (July 2012), excise levy carbon-based content fossil fuels (coal, petroleum, gas) means reducing greenhouse gas emissions contribute global warming climate change.carbon tax may encourage development clean energy sources Australia (renewable green energy wind, hydro, solar). India Japan has introduced carbon tax. In Europe, number countries have imposed energy taxes energy taxes based partly carbon content. There apparently “green tax” USA; however “green tax” supporter often cite gasoline tax “green tax”. Many European countries have used pollution taxes imposing taxes emissions common air pollutants sulfur dioxide nitrogen oxides. To combat negative environmental effects, several states India (Maharashtra, Andhra Pradesh, Himachal Pradesh, Karnataka August 2010) have implemented/going implement new “green tax” fight pollution old vehicles (commercial vehicles years old private vehicles years old) creating better public transportation. Very recently, Bangladesh imposed green tax (June 2014) force polluting factories (principally tanneries) pay extra levies clean country increasingly dirty rivers reducing impacts aquatic environment. Everyone may not agree “green taxes” however, “green taxes” seen incentive lessen environmental burden preserve environment.revenues generated “green taxes” used environmental preservation projects cut taxes. Nevertheless, everyone sure would see environmentally sustainable future healthy natural living environment their country. Can “green tax” reduce pollution country? Climate Change Environmental Performance Incentives Environment Pollutants Green Energy Fossil Fuels Behavior Environmental Sustainability Pollution Carbon Tax Technical College Požarevac. UN publication You have data regarding different types taxes belong GREEN. Asmat Ali PMAS Arid Agriculture University I idea "green tax". I think tax incentive reduce pollution country create awareness pollution. University Northern Iowa. There many forms make people follow green policies. Direct taxes emissions least costly way generally more efficient. This may suitable electric generation systems. But always not sufficient. Pollution not caused product made. That why we need take total life cycle approach. That there must indirect approaches taxing. For example emission standards cars good example. Incentives not driving cars providing cheaper better alternatives mass transport. Another form subsidies changing renewable sources energy material. Arid Agriculture University. I idea "green tax". I think tax incentive reduce pollution country create awareness pollution. Green tax definitely incentive reduce pollution country. It makes companies work reduce pollution direct benefit companies wise they well pay penalties taxes. Birzeit University. In principle yes. This looks attractive idea, however, implementation not easy, issue loaded details uncertainties, requires international cooperation. Moreover, In realm money economics taxes penalties stand legislation pollution. As start, environmental education must penetrate school curricula world wide create positive awareness. El Bosque University. Well, country, fact many countries, we currently facing terrible problem: open extractive mining.damage environment awful may take decades nature recover, according number studies.government here not know anything green tax. initiative brought congressman but government ignored initiative. Green tax necessary, doubt it. However, political well social action should undertaken.big international mining corporations simply care revenues incomes, not environment, apparently. RMIT University Thank you yes both direct indirect taxes would important. Of course, using public transport green energy would reduce carbon footprints RMIT University Thank you agreeing “green taxes” would help reduce pollution Pakistan! RMIT University Yes, implementation new policies (“Green taxes” case) help reduce pollution country! RMIT University Yes awareness education merits ‘green taxes” would vital levels including primary secondary schools RMIT University It looks you have significant mining Colombia. Both mining mineral exploration cause significant impact environment generation hazardous wastes contaminating air, soil, water, plants food sulfate, metals metalloids, radioactive substances, fly ash, mining processed chemicals etc . Australian National University Unfortunately, Australia did introduce carbon tax, there has been change government, there bill parliament repeal carbon tax (the carbon tax referred current government "toxic tax").advantage tax clear, but unfortunately, tend unpopular business well significant part public. Interestingly prime minister recently referred increase petrol excise carbon price signal discussions President Obama comment likely haunt him future! There two mechanisms encouraging shift activities less environmentally damaging s. One introduction taxes (stick), subsidies (carrot).problem subsidies drain countries budget. Subsidy programs existed Australia well carbon tax introduced, encouraging households install solar power systems, rainwater harvesting greywater systems etc. Particularly solar system incentives have lead increase cost power i.e. resulted indirect tax, money money going government. It shames me admit Australia has taken significant backward step area. Instead focusing ways reduce individual tax burden reducing carbon footprint, focus has been impact carbon tax cost living, reluctance take lead globally (we continually hear cry "why should we pay tax countries not").tax designed significant areas economy exempt tax not way go. Everyone should pay tax. Further, view tax should expanded include adverse impacts environment. Unfortunately, care environment doesn't appear important many people great nation. We having nice environment live in, but many not interested doing anything cost money ensure protection environment. Kuwait Institute Scientific Research Did we ever enquired taxes collected utilized they really utilized subsidize greener technology merely used revenue? RMIT University Thank you elaborate discussion topic I know current government Carbon tax introduced previous government support green. Yes unfortunate situation hope C tax remains intact sake environmental sustainability. When developing nations Bangladesh India introducing “ green taxes”, Australia should not take back ward steps area! RMIT University I donot know taxes are/were collected but donot know they have been utilized greener technology. By way you have sort “green taxes” Kuwait? Siksha O Anusandhan University Green tax (or environmental tax) taxes imposed environmental pollutants goods se repeated contributes pollution. It novel idea enforce introduce taxes substances, pollute environment, ultimate aim being substantial reduction pollution. In country India, green taxes shall have deterrent effect, sensitizing denizens pollution control management. This paper discussed issue imposition green taxes shall assist reduction pollution. http://papers.ssrn.com/sol3/papers.cfm?abstract_id=20 0 Kuwait Institute Scientific Research No Golam certainy not we dont have sort tax ever Kuwait including tax free income. But, I dont think countries collect green tax spend subsiding greener technologies. What airline they pay sort tax? they calculate CO produced trip they liable payment. And thsi payment utilized mitigate GHG effect. RMIT University I had quick read paper you emailed, suggested we should consider environment public good. When tax imposed polluting environmentally harmful substance activity, generally helps reduce harmful substance polluter make decision not carry activity cause pollution. Further, introduction “green tax” may cause change behaviour environment! Technical College Požarevac "Environmental Taxation Tool Sustainable Development ..." good resource thread, regarding country. http://ideas.repec.org/a/ibg/eajour/v y2012i1-2p32-44.html Technical College Požarevac In UN publication You have data regarding different types taxes belong GREEN category, see page 28... http://books.google.rs/books?id=fVA0Gmp4ra0C&pg=PA27&lpg=PA27&dq=Environmental++taxes+in+serbia&source=bl&ots=dNKHDBAEDg&sig=VgRwrkcAdT-ppdGELIhjq8b gw&hl=en&sa=X&ei=j4GhU8_SMOLNygOB9oGQBw&ved=0CEsQ6AEwBw#v=onepage&q=Environmental%20%20taxes%20in%20serbia&f=false RMIT University many thanks two links related topic. I read both papers suitable time ( days time) make summary Kuwait Institute Scientific Research Ljubmoir thanks sharing papers. Technical College Požarevac You welcome @Golam @Saif! I try give best! RMIT University A short review highlighting key points paper “Environmental Taxation Tool Sustainable Development Policy-State Comparison Serbia Application Ecological Taxation Reform European Union Munitlak Ivanović, O., et al., Environmental Taxation, EA (2012, Vol. , No, 1-2, 32-44) Ecological/Environmental/ eco taxes imposed goods have impact environment particular scarce natural resources. Ecological taxes help reduce pressure environment encouraging industrial producers develop/implement more efficient technologies produce goods ecological friendly. As result taxes support environmentally sustainable development doing less harm environment. In EU, ecological taxes collected energy taxes, pollution taxes, resource taxes transport taxes, Western Balkans (Albania, Bosnia Herzegovina Croatia, Macedonia, Montenegro, Serbia), ecological taxes collected taxes plastic containers, import motor vehicles, carbon tax, fossil fuel tax, CO emission tax, CFC tax, eco taxes special waste flow new automobile; gasoline diesel tax; environmental compensations (for harmful industrial waste disposal; packaging materials packaging waste, CO emission, waste motor oils) etc. Among Balkan countries, Croatia has made much progress collecting enforcement tax reforms.Republic Serbia introduced environmental taxes (eco-taxes special waste flow, using motor vehicles, new automobiles). Albania, Bosnia Herzegovina, Macedonia Montenegro, have not made much progress environmental taxation compared Serbia. It important note ecological taxation imposed country should efficient terms ecology (to achieve goals environment protection least price), efficient terms economy (to interfere least possible resources allocation market), simple terms taxation administration, cheap taxation neutral comparison competition terms free trade. Freie Universität Berlin Very interesting question thread, indeed. I would add two aspects:wave ecological tax reforms mid/end 1990s Europe (e.g. Denmark, Germany) entailed revenues incentivising employment reducing cost labour (e.g. reducing income tax contributions social security schemes). Thereby, double dividend created: providing incentives reduce emissions /resource reducing costs labour increasing employment.aspect I would highlight difficulties border tax adjustment: From point view environment, taxation emissions would preferable. However, secondary energy (electricity) imported, border tax adjustment not possible current framwork international trade law. Hence taxation fuels instead emissions preferred avoid problems loss competitiveness, second best point view environment. RMIT University Thank you inputs. Yes tax revenues environmental green taxes used cut taxes Universitat Oberta de Catalunya A point I not think has yet been made relationship green taxes forms taxation. Adding 8000€ emissions tax vehicle costs 20000€ may well expected have effect consumers' choices, impulsing them more efficient options.effect same tax 120000€ vehicle probably next nil same vehicle already have attracted much larger sales tax European countries. I thinking typical family car first place, commercial vehicle second. Perhaps we need distinguish forms taxation aimed individual aimed businesses industrial applications. Kuwait Institute Scientific Research Alan you perfectly right.taxation vehicle should related their actual emission. I they put tax gasoline go emission reduction big gas grazers take more fuel indeed pay more instead direct tax. RMIT University Thank you inputs. I have inquiry taxation family commercial vehicles; taxation vehicles (private commercial) should differed based (a) age vehicles (old new) (b) environmental performance (CNG, petrol-CNG, petrol-electrical, electrical, petrol, diesel)? University South Africa Yes South Africa has similar taxes, but tax incentive scheme implemented 20 , tax deductions made energy savings/ carbon footprint reduction, referred SARS Section 12L tax incentive. Kuwait Institute Scientific Research These taxes incentives positive but really reduce carbon footprint merely taxation. RMIT University Thank you informing South Africa going implement green taxes well green tax incentive scheme 20 . I understand South Africa first African nation 2nd BRICS nation introduce carbon tax aimed reducing emission gases related climate change (@ R120/ ton carbon-dioxide equivalent increase 10% year first phase implementation, 20 -2020). In addition, I feel community awareness education would vital, example energy water savings, energy water efficiency, renewable energy, pollution etc Kuwait Institute Scientific Research Golam Thanks information initiating question. But we providing level plain field.biggest emmiters establishing Carbon trade, even US not participating. reduction emission developing countries often compromise their pace development, thoughts this. National Kapodistrian University Athens Hm, Greece, emissions rights Public Electricity Company increased electricity bills dιd not reduce pollution lignite... Kuwait Institute Scientific Research I not Greece problem but countries even more developing third world. RMIT University Key points growth “tax” green tax incentives penalties: Australia Energy efficiency: Australian government invested (a) A$800 million (US$ million) clean technology investment programme (grants encourage manufactures invest energy efficient equipment low emissions processes product); (b) AU$ 200 million (US$210 million) energy efficiency grants programmes specific food foundry industries; (c) AU$ 70 million (US$ million) help coal mining industry implement energy saving carbon abatement technologies; Carbon tax (passed November 2011; commenced July 2012): Australia’s carbon price @ AU$ (US$24) ton, rising 2. percent year 30 June 20 ; Carbon sequestration (passed August 2011): Australia has introduced Carbon Farming Initiative (CFI) encourage farmers land managers. earn carbon credits storing carbon reducing GHG emissions land; Green innovation: Australia has number major programs initiatives including AU$ 3. billion (US000 eligible claims financial year; Water efficiency: There financial incentive minimize carbon emissions wastwater recycling treatment; grant funding (AU$ 0 million (US$ 470 million) influence behaviour water sector On-Farm Irrigation Efficiency Programmes; importantly Australian Government committed AU$ 3. billion (US$ 3.2 billion) “Restoring Balance “in Murray-Darling Basin programmes purchase water environment (commonwealth environmental water).This environmental water has been/is being recovered water saving infrastructure upgrades. billion) ARENA (Australian Renewable Energy Agency) initiative promote innovation renewable energy; AU$ 300 million (US$ 311million) help steel industry become efficient economically sustainable low carbon economy; AU$ 200 million (US$ 20 million) Clean Technology Innovation Programmes; Green vehicles (commenced July 2012): Australia has introduced LPG (Liquefied petroleum gas liquid petroleum gas) vehicle Scheme aimed increase LPG transport fuel. Grants provided conversion registered vehicles LPG (AU$ 1,000) (US$ ) purchase new LPG vehicles (AU$ 2,000) (US$ 1830). Grants capped ,000 eligible claims financial year; Water efficiency: There financial incentive minimize carbon emissions wastwater recycling treatment; grant funding (AU$ 0 million (US$ 470 million) influence behaviour water sector On-Farm Irrigation Efficiency Programmes; importantly Australian Government committed AU$ 3. billion (US$ 3. billion) “Restoring Balance “in Murray-Darling Basin programmes purchase water environment (commonwealth environmental water).This environmental water has been/is being recovered water saving infrastructure upgrades, water purchases (direct buybacks water entitlements irrigators) water recovery programmes order protect restore environmental assets Murray Darling basin; Material resource efficiency & waste management: Australian government encouraging reduce environmental impacts consumer packaging improvements packaging design, higher recycling rates better stewardship packaging. Grants available industry focus initiatives related glass, plastics recycling programs. Over AU$ 6. million (USplastics recycling programs. Over AU$ 6. million (US$6. million) funding has been provided 40 new projects 2012-201 fiscal year (summary basedKPMG Green Tax Index 2013: An exploration green tax incentives penalties) RMIT University University Antwerp. million) funding has been provided 40 new projects 2012-20 fiscal year (summary basedKPMG Green Tax Index 2013: An exploration green tax incentives penalties) RMIT University University Antwerp, Belgium sent answer direct me, summary follows: Tax domestic wastes: City Antwerp , Belgium, has buy different types waste bags warehouses separate paper, glass, organics etc, therefore more bags need, they have pay more bags (which tax). Anyone not following principles (not properly separating wastes) fined (which incur additional tax government) Tax waste water: Each resident city (Antwerp) has drinking water counter, registers amount drinking water consumed yearly basis. Based drinking water consumption, city assumes percentage drinking water ends waste water sewer system. Based ’s drinking water consumption, s/he taxed fixed percentage.tax money used purify sewer waste water, cleanly disposed off river. One important note: system has been implemented, there has been behavioural change communities, example lot inhabitants city now collect rainwater store used washing clothes, flushing toilets, irrigating gardens small food plots etc. Therefore residents using rain water not saving precious resource drinking water but paying less tax, thus saving water bills well win win situation all! Kuwait Institute Scientific Research Frank Thanks sharing information. I waste seggeregation implemented several countries leads efficient waste management recycling. Unfortunately completely ignored third world, lots recycling takes place there. Waste water tax common across several countries. But why drinking water metered? domestic water supply metered drinking only? wastewater drinking essentially sanitary waste water may not require same treatment detergents chemicals. RMIT University It drinking water (tap) Frank refereeing same water used toilet flushing washing clothes What you mean domestic water?. Do you have separate meters Kuwait ? Kuwait Institute Scientific Research Golam usually homes Kuwait have two type water desalinated water domestic household uses (including drinking water), metered paid.brakishwater usually used cleaning/washing house, cars free. RMIT University Good suggestion, I support idea giving incentive process environmental management! RMIT University Awareness education communities important take care environment, may happening small large scale depending countries; but alone may not sufficient behavioral changes may not happen sort enforcement laws. For example, Belgium has buy different types waste bags (as tax) warehouses separate paper, glass, organics etc, may small tax but helps motive people make less waste. Other examples, there free water (e.g. tap water drinking, bathing, cooking) free energy (e.g. gas cooking, heating) available public, people likely make waste but they have pay fees services, automatically encourage them reduce waste. Such behavioural changes not help save energy (less greenhouse gas emissions) but helps save their water gas bills. Nevertheless, Green taxes” ‘Carbon tax’ generally target big polluters (industries) levies vehicles target rich people not poor people, many people poor countries cannot afford cars! I understand Government India serious pollution demonstrated new initiatives using green energy/renewable energy run rail trains Unfortunately, green policy lead loss competitiveness Europe lead massive unemployment nobody wants talk about. RMIT University I donot know many jobs lose consequence ‘green taxes” India (perhaps you have statistics this?) but green taxes stimulus create new jobs sectors like, clean energy/renewable energy, innovation development rural development solar wind power. In rural areas there may not have electric grid supply electricity, however solar energy fulfil gap, solar power /wind power create rural jobs. Further ‘green taxes” aimed creating good environment living livable city, healthy environment including biodiversity, less water pollution less food contamination. Are they not good current future generations? According latest WHO report released May 2014, thirteen dirtiest/most air polluted cities (out 20 polluted cities) identified WHO were actually located India (with New Delhi, Patna, Gwalior Raipur top four spots.) Other cities high air pollution were Pakistan Bangladesh (based particulate matter (PM) PM2. (diameter 2. less). In contrast, cities lowest level pollution were found developed countries (Canada, United States, Finland, Iceland Sweden). Particulates matter refers ammonia, carbon, nitrates sulfate small enough pass bloodstream cause diseases emphysema (a condition air sacs lungs damaged enlarged, causing breathlessness) cancer. In fact, high concentrations small fine particulate matter pollutants particularly associated high numbers human death heart disease stroke, well respiratory illnesses cancer. Therefore more actions measures required developing countries reduce pollution order safe guard human environmental health unhealthy environment, people may perform their jobs unsatisfactorily often may ask short long term sick leaves costly employers! Technical College Požarevac Regarding previous discussions green taxation vs social problems may arise, I find contribution good, analytical ! environmental taxation.jpg RMIT University Thanks links, I agree main conclusions green taxes balanced reducing taxes ‘revenue recycling’, research suggests green taxes result overall economic improvement! Madrid Institute Advanced Studies We carried analysis using energy optimisation model country level (Spain) considering taxes pollutants ceilings derived European policies. This helpful: Article Evolution NOx SO emissions Spain: Ceilingstaxes Golam friends, I late discussion, but I would bring different angle same issues: As you may know 20 RIO +20(UNCSD) there formal paradigm shift tradional market thinkin Adam Smith green markets/green growth based markets. In traditional markets, enviromental issues externality issues, therefore they should dealt externaliites. In green markets environmental issues now endogenous issues therefore they should dealt internalities.....problem is, paradigm shfited creating green market knowledge gap there theory yet "the perfect green market", there green economics there green macroecomics we not have proper tools deal green markets, explains why developed developing countries UN global institutions alike having difficulties setting green markets.... Under perfect green markets environmentally friendly consumers producers would responsive green taxes they now endogenous issues... I sharing here four documents I sure you participants may find interesting food thoughts internalize environmental issues social issues price structure markets: A good day all.Past Versus Present Development Thinking: Pointing Out Structure Old Agricultural Development Model After Internalizing Environmental Externalities.Present Versus Future Development Thinking: Towards Agricultural Sustainability What If Markets Have Always Been Distorted? Would It Then Be Good Fix Add Fair Trade Margins Correct Distorted Agricultural Market Prices?. ArticlePast Versus Present Development Thinking: Pointin... ArticlePresent Versus Future Development Thinking: Towar... Article What If Markets Have Always Been Distorted? Would It Then Be... Madrid Institute Advanced Studies Here you'll find work we did taxes regulatory instruments reducing NOx SO Spain techno-economic optimisation energy systems model: https://link.springer.com/article/10.1007/s10098-0 -0923-z Technical College Požarevac THE ROLE OF ENVIRONMENTAL TAXES IN SERBIAN TAX SYSTEM!aim paper point lack giving importance ecological taxes low participation dedicated revenues structure taxes tax system Republic Serbia. Environmental taxes have gained importance, especially ecological tax reform number European countries, have proved significantly more effective compared available instruments struggle environmental problems.premise paper inadequate structure environmental taxes has negative impact allocations field environmental protection. This hypothesis tested using statistical methods comparative analysis... RMIT University Can anyone suggest me way green tax has imposed? central policy i.e. taxing source import should paid end user?? Technical University Sofia North South University Yes, green tax best way, but should packaged revenue-neutral way & we may increase taxes Bads/pollution & reduce tax Goods, hard-earned income.key solution raising public awareness & education.